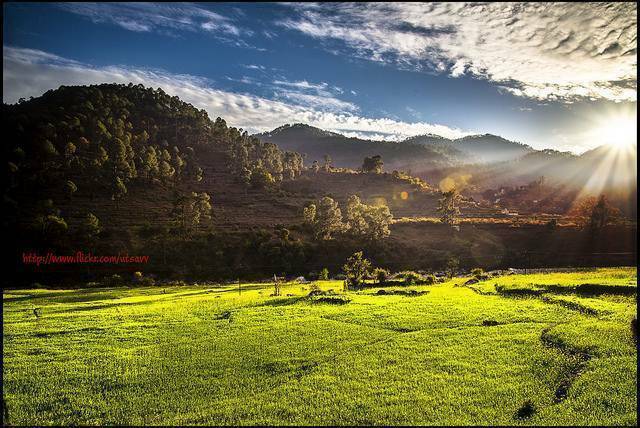 If anyone has been to Almora they most definitely won’t miss Kausani in the District of Bagheshwar, a gorgeous, minuscule hamlet which offers you with the most breath-taking view of the Himalayan Range. Now this is just the one thing a Himalayan enthusiast wouldn’t want to miss. Amidst the pine trees, the peaks of Trishul, Nanda Devi and Panchachuli are lucidly seen. If one wants to vacation quietly without the bustling energy of the usual tourists’ one should definitely savor Kausani. It’s a best weekend getaway for people living in Delhi, and is easily accessible from Almora which is roughly 50 kilometers away. The Anashakti Ashram where once Mahatma Gandhi halted is quite renowned but other than that this place is purely a true nature lover’s abode, which in itself is quite brilliant. It is for this Himalayan hill station’s bewitching scenic landscapes that the Father of the Nation Mahatma Gandhi coined the sobriquet "the Switzerland of India" for Kausani‎. Resting on the Ping Nath Peak surrounded by dense vegetation of wiry pine trees and flanked by the mighty Kosi and Gomti Rivers the city offers an unbelievable three sixty degrees, extended embracing the view of the Himalayas. The best way to explore the city is to walk around slowly soaking up the soothing serene mountain scapes or experience the old world charm using the horse drawn carriages. The city hosts two major fairs in a year -one during Dussehra spread over 10 days generally in the month of October and November, and the second fair called Uttarayani organized during Makarsankranti in January every year. The city is also famous because of its forests in the city having tigers wandering its paths. Nevertheless it is considered a trekkers haven. The KMVN (Kumaon Mandal Vikas Nigam) rest house in Kausani is an ideal place to stay and it provides panoramic views of the mountains. One can find all kinds of food but some of the Kumaoni dishes are specialty and must to taste. Also there are indigenous shawls made by the villagers which are worth buying.